Prologue, Act IV. With the English army in France. Act IV, Scene 1. The English camp near Agincourt. Henry and his army await battle. In the next exchange, Henry speaks to his two brothers, the dukes of Gloucester and Bedford. Which is both helpful and good husbandry. Gloucester: We shall, my liege. Erpingham: Shall I attend your grace? Henry V: No, my good knight. Erpingham: The Lord in heaven bless thee, noble Harry. Henry V: God-a-mercy, old heart! thou speak'st cheerfully. Bates: I think it be; but we have no great cause to desire the approach of day. Williams: We see yonder the beginning of the day, but I think we shall never see the end of it. Henry cracks twig. Who goes there? Williams: Under what captain serve you? 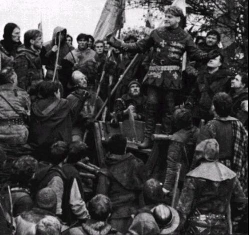 Henry V: Under Sir Thomas Erpingham. Williams: A good old commander and a most kind gentleman: I pray you, what thinks he of our estate? Henry V: Even as men wrecked upon a sand, that look to be washed off at the next tide. Williams: He hath not told his thoughts to the king? Bates: He may show what outward courage he will, but I believe, as cold a night as ‘tis, that he could wish himself in Thames up to the neck, and so I would he were, and I by him, at all adventures so we were quit here. Henry V: ...I think he would not wish himself anywhere but where he is. Henry V: [I dare say you love him not so ill, to wish him here alone, howsoever you speak this to feel other men’s minds:] Methinks I could not die anywhere so contented as in the king’s company, his cause being just and his quarrel honorable. Williams: ‘Tis certain, every man that dies ill, the ill upon his own head; the king is not to answer it. Bates: I do not desire he should answer for me; and yet I determine to fight lustily for him. Henry V: I myself heard the king say he would not be ransomed. Williams: Ay, he said so to make us fight cheerfully; but when our throats our cut, he may be ransomed, and we ne’er the wiser. Henry V: If I live to see it, I’ll never trust his word after. Williams: You pay him, then! That’s a perilous shot out of an elder gun that a poor and a private displeasure can do against a monarch. You may as well go about to turn the sun to ice with fanning in his face with a peacock’s feather. William stands up, Bates does also and grabs cloak of Henry. You’ll never trust his word after! Come, ‘tis a foolish saying. Henry V: Your reproof is something too round: I should be angry with you if time were convenient. Bates: Be friends, you English fools, be friends: we have French quarrels enough. Williams and other soldiers leave; Henry remains at fire alone. Save ceremony, [save general ceremony]? What are they rents? What are thy comings-in? Seek through the camp to find you. Henry V: My brother Gloucester’s voice! Act IV, Scene 3. English camp. Gloucester: Where is the king? Bedford: The king himself is rode to view their battle. Westmoreland: Of fighting men they have full threescore thousand. Henry V: What's he that wishes so? God’s will! I pray thee wish not one man more. And crown for convoy put into his purse. And say "Tomorrow is Saint Crispin's." And say "These wounds I had on Crispin’s day."